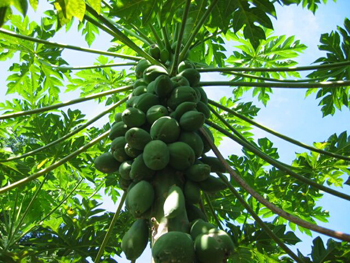 The papaya tree grows to a height of up to 25 feet; the palmlike trunks have soft wood and sometimes divide into several erect stems, each with a head of large, palmately lobed leaves that are near orbicular in outline. The lobes themselves are pinnately lobed. The hollow petioles are 2 feet long or more. Male and female flowers are usually on separate trees; slender racemes on funnel-shaped, yellow male flowers become up to 3 feet long; the female flowers have 5 yellow, twisted petals and grow singly or in sparse corymbs. The fruit is a large, oblong or nearly spherical, fleshy berry with a yellow or orange rind like a gourd. It may be from 3 to 20 inches long and weigh up to 12 lb. or more. The ripe yellow fruits hang more towards the bottom of the tree; further up they are still green and unripe. They look like melons, are hollow inside and full of small, black, moist, round seeds. Found in tropical America. Introduced and now cultivated in southern China and other tropical parts of the Far East. Papaya is called paw-paw but the real common paw-paw (Asimina triloba L.) has smaller fruit and tastes and texture something like bananas. It is a small tree or shrub; 9-30 feet tall, flowers are dull-purple, drooping; petals are curved backwards. Seeds are toxic. Leaves may cause rash. The fruit aids in digestion, so make it a habit to eat a slice after meals if you are visiting the tropics. Or break off and eat a leaf, even if it is only as big as a large coin. The leaves are reputed to protect against tropical parasites. Papaya was a 16th century remedy for indigestion and constipation. It is, today, still one of the best. Centuries ago, natives of the tropics found they could eat exceptionally heavy meals of fish and meat without any apparent stomach distress if the meal was followed by a dessert of papaya. Modern research has shown that this tropical melon-like fruit contains a powerful protein-digesting enzyme called papain, which greatly resembles pepsin, the natural digestive enzyme found in the stomach. Papain extracted from the unripe papaya melon is so powerful that 5 grains of the white crystalline powder are said to digest a pint of milk in half an hour. The natural papain enzyme is made into tablets and sold as an aid to digestion. The tablet acts on acid, alkaline, or neutral conditions without being destroyed by intestinal juices. It is considered especially valuable as an aid to normal digestion of protein in the stomach. If you can’t get through the day without taking an antacid or two, this is the herb for you. Papaya is a safe and natural digestive aid; digests protein in the body. Take too many antacids and you run the risk of a rebound effect, that is the body produces even more acid, resulting in even more gastrointestinal problems. Papaya juice and/or tablets can be taken freely without fear of rebounding. The fruit is popular in Hawaii and is very delicious. Best known for its aid to digestion, due to its content of papain, an enzyme similar to pepsin, which is produced by the gastric juices of the stomach. 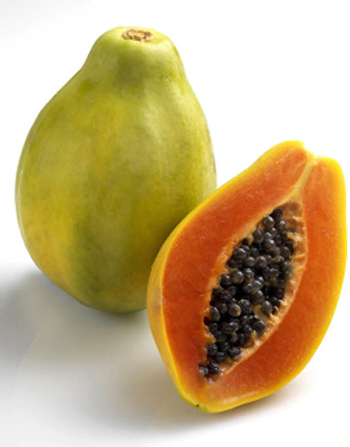 This protein-digesting enzyme makes papaya helpful for dyspepsia and other digestive difficulties. Either the fresh milky juice of the unripe fruit or the brownish powder to which it dries can be used; it stimulates the pancreas and aids in digesting fat and protein. This juice has also been used to remove freckles, and internally it acts as an effective vermifuge. The leaves are sometimes used to dress festering wounds. Improper protein breakdown in the system often leads to allergies. Papaya is effective in relieving allergies by its ability to denaturize proteins. A fresh, mashed papaya applied as a face mask will remove dead, flaky skin. Take 1 tablet 4 times a day to help with hemorrhoids, usually cures within a week. Juice: take 1 tsp. to 1 tbsp. as needed. Tablets: take up to 1 tablet 3 times daily to relieve symptoms. PubMed.gov: Carica papaya (Paw-Paw) unripe fruit may be beneficial in ulcer.